"Do not confuse luck with skill." The Replacement Killers hit American theaters in 1998 with the promise of being Chinese actor, Chow Yun-Fat's first Western film. It was to be his breakthrough into this market and, like most Hong Kong showbusiness types, it was also a move towards survival with the takeover of the mainland Chinese government. Yun-Fat, like countless other "living legends" of Asian cinema, had to rebuild his career all over again because of the fear that filmmaking would be seriously impeded by the new Communist government. When one keeps all that in mind, Replacement Killers is a respectable attempt at reviving the "heroic bloodshed" genre popularized in Hong Kong, and remains Yun-Fat's best Western action film. In fact, it was his first project since 1995's Peace Hotel, rumored to have been directed and produced by John Woo who reportedly took no credit to avoid it being known he had briefly returned to Hong Kong.In some ways, a remake of The Killer, Yun-Fat is John Lee, an expert assassin who works for aChinese crimelord, Terence Wei (Kenneth Tsang). Wei's drug smuggling enterprises are under heavy scrutiny from the police, especially Stan Zedkov (Michael Rooker), and when Wei's son is killed during a drug bust, he takes it personally. John Lee is asked to get revenge on Zedkov as his final favor to Wei, but he refuses. Lee can't bring himself to commit an unjust act, and his unwillingness to kill makes him the new target. Fearing for the lives of his family in China, Lee immediately attempts to get home and the only way to do so is to get help from Meg Coburn (Mira Sorvino), a document forger who can make him the required passports. Unfortunately, by going to her for help, they both become targets of Wei's senseless quest for vengeance and have to fight their way to freedom.This rather thin premise serves as the skeletal frame for a series of all-out, stylish action sequences where thousands and thousands of rounds are expended, and Yun-Fat gets to let loose with his gun-in-each-hand trademark. 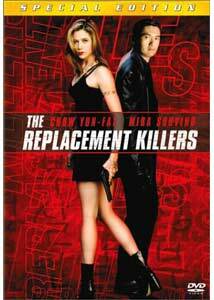 Despite being a bit shallow in the story department, Replacement Killers accomplishes being a decent, effective thriller with plenty of great gun battles, which is basically the core of the film. Director Antoine Fuqua grasps the style and technique needed to make the film fun, and he handles the melodrama well enough that I couldn't help but get flashbacks of many John Woo Chinese films, who produced this project. Why Woo himself didn't take the director's chair I'm unsure, but Fuqua does an admirable job.The cast is generally acceptable, but I think Mira Sorvino as Yun-Fat's companion was the weak link. I was never particularly convinced of her ability to be just as skilled and powerful as his character was, and that's what's generally implied. Other faces from older Chinese/John Woo films make an appearance, especially Kenneth Tsang, who starred with Yun-Fat in several previous works. Randall Duk Kim, another familiar face from HK cinema, briefly appears as a Buddhist monk who is friends with John Lee. These little touches add definite legitimacy to this project as one that wants to pay homage to it's origins. It isn't perfect, but it's a nice, simple, action machine that allows Yun-Fat to come across as the suave, classy fighter type that he's defined so well in the past. Image Transfer Review: It's been awhile since I've seen a transfer that's given me the confidence to grant an A+ rating, but Replacement Killers deserves it. The film is a maze of varyingphotography, and every element of the visuals really beams with sharp detail andatmosphere. The clarity of the transfer is amazing, running smooth and artifact-free even in the most complex sections. For such a stylish movie, the pristine image makes sure that the art is basically all you really see. I noticed no discernible edge-enhancement or other sharpness problems, and the darkest scenes were perfectly balanced between light and dark detail. Some scenes had slightly compromised black level quality, but it would seem to be a by-product of the kind of heavy smoke/grain photography that was being aimed for in certain places. Audio Transfer Review: A very expansive, loud and energetic Dolby 5.1 audio track is a nice way to enjoy the movie. Lots of effective split surround sounds are injected into an already excitingfront soundstage mix. The musical score takes most of the track's time, but whenever the action ramps up, there's tons of directional effects to bring you into the movie. The transition between front and rear speakers is well done and subtle, and the directional music effects are more impressive than it may sound. This is your average action film soundtrack, but it was definitely cared for not just a matter of cranking up the volume. Extras Review: A big improvement over the previous DVD, this new Special Edition packs in a fewinteresting features. A commentary by Antoine Fuqua provides some insight into thefilm's development and how Fuqua wanted to craft things. It takes him a while to get into the groove, but eventually he gets into it and reveals all sorts of anecdotes and information. Two documentaries are featured, though both are primarily promotional. The first is the original HBO First Look special, which runs about 25 minutes. It's a decent look at the making of the film, in addition to some good interview time with Chow Yun-Fat, but it's also not very in-depth or informative. In a similar vein is "Chow Yun-Fat Goes Hollywood," a 20-minute piece discussing Yun-Fat's career and overall history for those who have never heard of him. Again, though, it's primarily promotional in nature, and lacks a touch of dignity. Yun-Fat gets to talk about a lot of things, and the producers and other crew members put in their two cents, so it has some value, it's just not a very elaborate portrait of Yun-Fat as an actor. More interesting are the deleted scenes, most of which are really extensions of scenes already in the film. The trims were obviously made to quicken the pace, but seeing them helps paint an interesting picture of where Antoine Fuqua wanted some portions to go. The quality of the scenes is rather weak, but excusable. In addition, there is an alternate ending sequence, but it really isn't all that different from the theatrical ending. In fact, it appears to be just an alternate take. The package is rounded off with some trailers, brief filmographies for some of the cast and crew, and a nice themed presentation. While the extras aren't all that detailed, they still offer some good additional supplements for the fan, especially the commentary. As a basic actioneer, Replacement Killers is pretty good. It lacks much plot and has a few plot holes, but this is acceptable given the nicety of seeing Yun-Fat in his own element. If you never bought the original version, this SE treatment and fantastic video/audio quality is certainly worth picking up.